In the unlikely event that there's anyone out there eagerly awaiting the next instalment in the Great Tom Ripley Reread, I'm afraid you'll have to wait a while longer yet: for some reason I'm finding the fourth book in the series, The Boy Who Followed Ripley, heavy going. Nothing to do with the novel itself – at least, I don't think it is; I suspect I'm just a bit burned out with the intensive reading and note-taking those Ripley posts have ended up requiring. 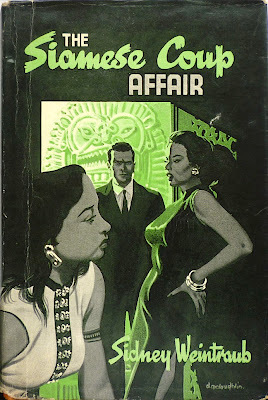 Anyway, the net result is that the next essay probably won't appear until the end of next week at the earliest, so you'll just have to make do with some more Denis McLoughlin-designed T. V. Boardman dust jackets in the meantime. 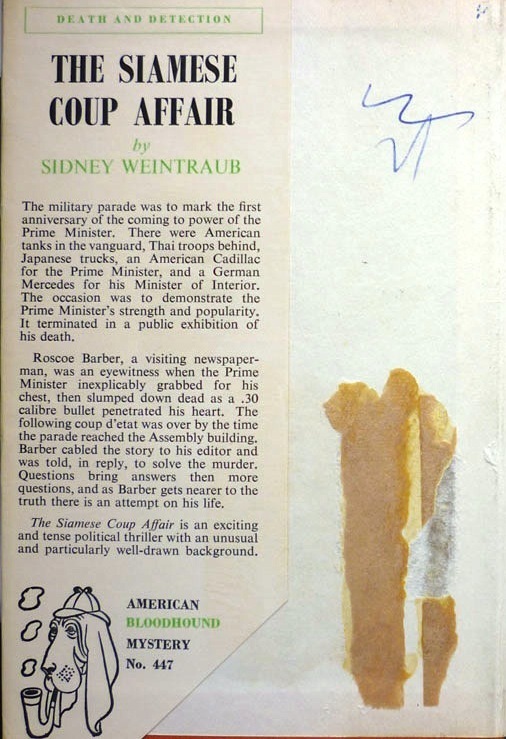 The Siamese Coup Affair by Sidney Weintraub, published in the UK by T. V. Boardman in 1963, #447 in Boardman's American Bloodhound Mystery line. 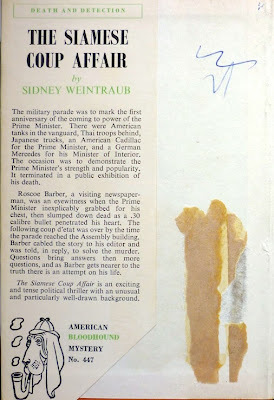 So far as I've been able to establish, this is one of only two novels Weintraub published, the other being Mexican Slay Ride, issued by Abelard-Schuman and Robert Hale the year before in 1962. But though Weintraub seems to have written just the two works of fiction, he has, I believe, and if I've got my facts right – so take the following with a pinch of salt – penned a hell of a lot of non-fiction. Indeed, it's for works like* his 1959 debut Price Theory (*like, but actually not; see comments) and a succession of other books on finance and free trade that he's rather better known, as well as for being a former William E. Simon Chair in Political Economy at the Center for Strategic & International Studies and a former member of the US Foreign Service. Of course, that could be an entirely different Weintraub – except for two things. 1) Weintraub the economist is evidently something of an expert on Mexico, so his having also written a thriller titled Mexican Slay Ride isn't entirely outside the realms of possibility; and 2) the 1964 Catalog of Copyright Entries lists both the novel The Siamese Coup Affair and the non-fiction work Intermediate Price Theory under Weintraub's name. So, in attempt to discover if Sidney Weintraub the thriller writer and Sidney Weintraub the economist are one and the same, I've taken the fairly radical step of trying to contact Mr. Weintraub. I'm not overly confident that I'll hear anything back, but if I do, I'll be sure to update this post. UPDATE, 19/3/13: Sidney Weintraub's son, Jeff, kindly emailed me the other day confirming that they are indeed one and the same – and not to be confused with the other Sidney Weintraub. Thanks, Jeff! Perhaps even more intriguing and curious than all of that, however, is this: while The Siamese Coup Affair was published by T. V. Boardman (apparently its only printing), Weintraub's 1962 (presumed) debut novel, Mexican Slay Ride, was published, as mentioned above, by Abelard-Schuman in the States and Robert Hale in the UK. 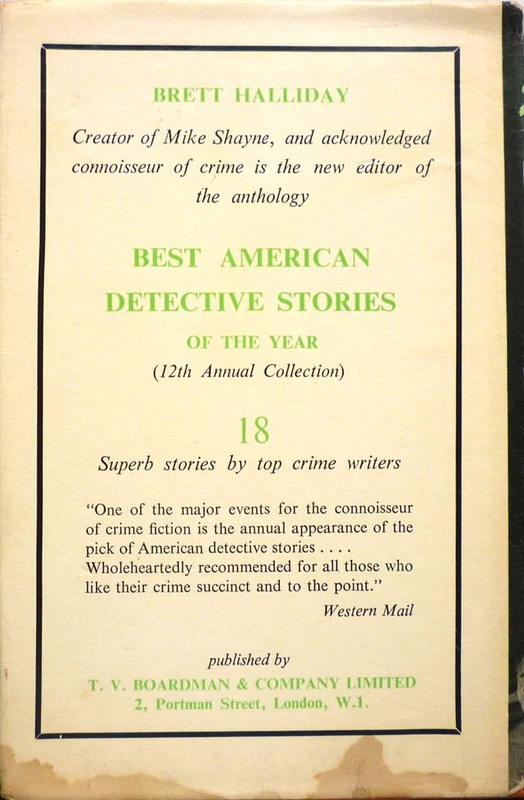 But in 1961, the year before that, Boardman itself published a novel titled Mexican Slayride (two words rather than three, note), by Boardman mainstay Thomas B. Dewey (actually retitled from its original US Dell appearance as The Golden Hooligan). 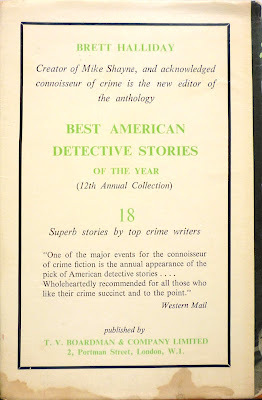 Moreover, in 1962, the same year as the Weintraub Mexican Slay Ride, Gold Medal in the States published a novel titled – you guessed it – Mexican Slay Ride, this one by Neil MacNeil, alias W. T. Ballard. Three different novels, all titled Mexican Slay Ride (or Slayride), all appearing in the space of two years: what the hell's that all about? What was the weird fascination with that title? I must admit I'm unfamiliar with either a Mexican slay ride or if it is, as it appears to be, a play on words, a Mexican sleigh ride, although I'm assuming in this context it's nothing to do with any of these practices. Furthermore, whether or not these three novels were an influence on either the American title of this film or the pilot of The A-Team is also beyond my ken, although given that A-Team co-creator and writer Frank Lupo is a keen collector of crime and spy fiction, one never knows. Answers to any of the above on a postcard, please. Ah, so we may be talking about two different Sidney Weintraubs then. Hmm. Let me know what you turn up, FR, and I'll update the post. "Sidney Weintraub." Contemporary Authors Online. Detroit: Gale, 2001. Literature Resource Center. Web. PERSONAL INFORMATION:Family: Born May 18, 1922, in New York, NY; son of Reuben and Anna (Litwin) Weintraub; married Gladys Katz, August 11, 1946; children: Jeffrey, Marcia Weintraub Plunkett, Deborah. Education: City College (now City College of the City University of New York), B.B.A., 1943; University of Missouri, M.A. (journalism), 1948, Yale University, M.A. (economics), 1958; American University, Ph.D., 1966. Military/Wartime Service: U.S. Army, 1943-46. Memberships: Society for International Development, American Economic Association, American Foreign Service Association, Cosmos Club (Washington, DC). Addresses: Home: Washington, DC. Office: Lyndon B. Johnson School of Public Affairs, Drawer Y, University Station, Austin, Tex. 78712. CAREER:U.S. Department of State, Washington, DC, foreign service officer in Madagascar, Mexico, Japan, and Chile, beginning in 1949, deputy assistant secretary for international finance and development, 1969-74, interagency development coordination, assistant administrator, 1974-75, executive director of committee, 1974-75; University of Texas at Austin, Lyndon B. Johnson School of Public Affairs, Dean Rusk professor, 1976--. Senior fellow, Brookings Institution, 1978-79. Member of advisory board, Institute of Latin American Studies and Office of Mexican Studies. International economic consultant, 1981-82. •Mexican Slay Ride (novel), Abelard, 1962. 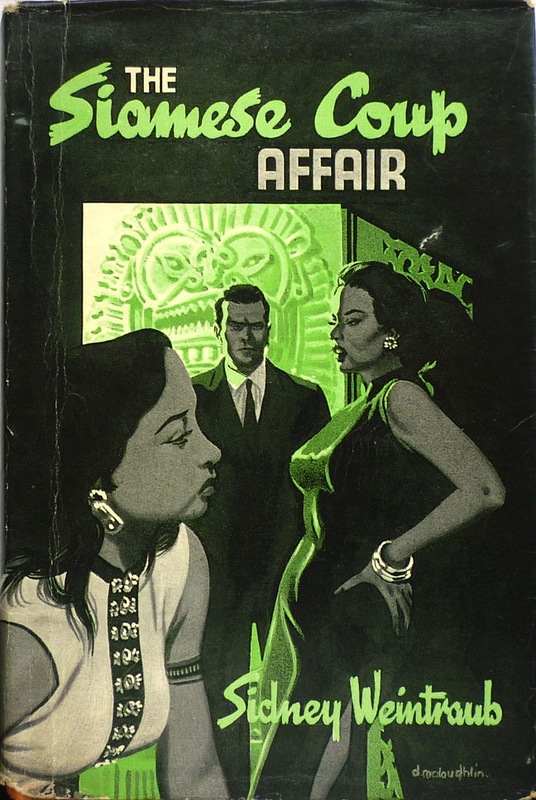 •The Siamese Coup Affair (novel), T. V. Boardman, 1963. •The Foreign Exchange Gap of the Developing Countries, Princeton University Press, 1965. •Trade Preferences for Less-Developed Countries, Praeger, 1967. •United States-Latin American Trade and Financial Relations: Some Policy Recommendations, CEPAL (Santiago, Chile), 1977. I've snipped the rest of his bibliography, but you get the idea. The 2012 "The Writers Directory" (pub. St. James Press) and "Contemporary Authors" (2001) confirm that he wrote both novels. Best of all the 1972 "Who's Who in Government" also identifies the fellow born in 1922 as the author. It lists his home and office. Therefore we may safely assume that Weintraub himself contributed the information. Ah... there are two Sidney Weintraubs. The one who wrote "Price Theory" in 1959 and its sequel died in 1983. He was born 1914. The other fellow born 1922 and the author of considerable non-fiction is still with us and he wrote the two novels; these were his first two published works as the partial bibliography above shows. Gotcha. So I was pretty much right, apart from attributing Price Theory to our Mr Weintraub. Of course, that does beg the question -- two Sidney Weintraubs, both published economists: are/were they related...? Unlikely. Sidney Weintraub is a fairly common name. FWIW, there are multiple writers named "John Gardner", "Alan/Allan Williams" and "Christopher Wood". Ha, spoilsport. I was hoping to instigate a new mystery there! And the most important question: is the book actually any good? The Siamese Coup Affair, that is, not Price Theory.